Produced by the Perth Mint since 1990. The design changes each year but always depicts Queen Elizabeth II on the obverse. 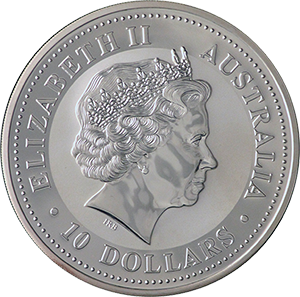 The 10 oz Australian Kookaburra Silver Coin is a highly collectable item that was introduced by the world-renowned Perth Mint in 1990. It proved to be an instant hit with investors and collectors alike and the full 300,000 maximum mintage sold out quickly. While production fluctuated the next few decades, in 2008, following the global financial crisis, numbers picked up again and the Kookaburra now produces 500,000 coins per year. The coin is available in standard weights of 1oz, 2oz, 10oz and 1kg. 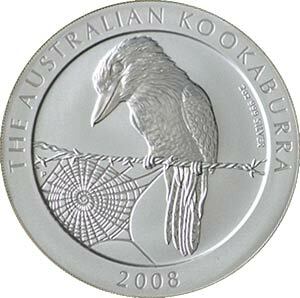 The 10 ounce Kookaburra coin itself has a diameter of 75.50mm and a thickness of 8.7mm, quite unusual for such coins. The coin weighs, in its entirety, 312.347g. 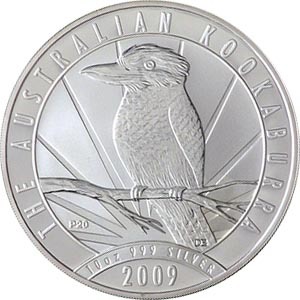 Up until 2018, purity of the Australian Kookaburra was .999% silver, but this was increased to .9999%, thanks to improvements in refinery techniques, which brings the coin inline with the very purest of silver coins on the global market today. The design of the 10 ounce Kookaburra Coin changes each year, and as such the coin is extremely popular with collectors, who often endeavour to obtain the entire set, going all the way back to 1990. It is for this reason that the coin typically trades above spot value (market value of the coin’s gold content). The obverse of the coin always portrays the figurehead of Queen Elizabeth II, which has changed only once due to the updating of the portrait itself to bring it inline with the monarch’s age. The inverse, instead, depicts the iconic Kookaburra, which along with the Kangaroo and Koala, is thought to perfectly represent Australia and its culture. It is this design that changes year on year, with the only exception of 2015, which showed the coin’s original design in order to mark its 25 year anniversary.